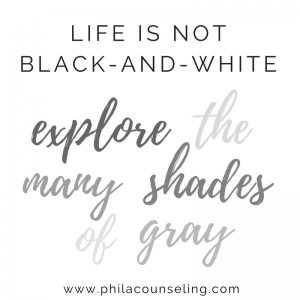 Don’t fall into the trap of “Black or White thinking”: Look for the shades of gray. We tend to trust what goes on in our brains, and so we tend to believe the thoughts that we have. But the truth is “thoughts are not facts”. 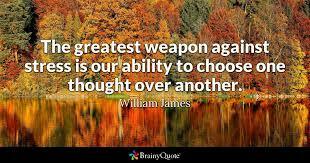 Sometimes what we are thinking is not only incorrect, but can also be unhelpful. Psychologists call these thoughts “thinking errors” or “cognitive distortions”. Cognitive distortions are patterns of thinking that are often automatic, are inaccurate, and have the potential to make us feel bad. In fact, people who have a lot of cognitive distortions in their thinking show more symptoms of depression, anxiety or panic than those who don’t. 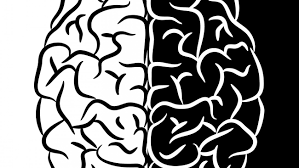 One common cognitive distortion is referred to as “black or white” thinking. 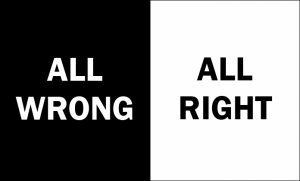 People who engage in black or white thinking tend to look at situations in terms of extremes – all or nothing. Things are either good or bad, always or never, enemy or friend, beautiful or ugly. People who think in black and white terms see a small mistake as a total failure. They reduce a whole continuum of possibilities down to the two most extreme options, the polar opposites of each other. Black or white thinking oversimplifies the complexity of life, making it more difficult to see the alternatives in a situation or to see possible solutions to a problem. Most of life’s events are not ‘completely disastrous’ or ‘absolutely wonderful’ but fall somewhere in the middle. Not black or white, but shades of gray. Life doesn’t fall into tidy small boxes. Most events call for a more moderate explanation, in order to figure out how to deal with them. Challenge your black or white thinking. 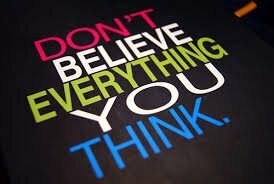 Don’t just accept that what you are thinking is the truth. Examine the evidence. For example, if you make a mistake at work, black or white thinking could lead you to believe “I can’t do anything right. I am a terrible employee. Everyone else is a better worker than me. I’ll probably get fired.” If I’m not perfect, I’m terrible. And that will make you feel bad, of course. 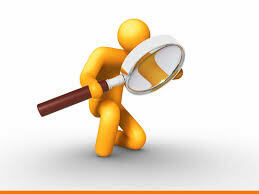 Look for the evidence, examine the facts. What actually happened? What facts would be agreed upon by others observing the situation. What might you say to a friend who is in the same situation? 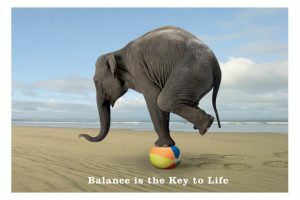 Try to think of a more balanced thought. For example, acknowledging that you’ve been at the job for a long while, there’s never been a complaint, your boss recently complimented your work, will help you see the “gray” in the situation, and come up with a more balanced conclusion. “Yes, I messed up this time. Nobody’s perfect. Everyone makes mistakes. I won’t make that one again, and, overall, I know that my boss is pleased with my work. Everything will be okay.” That “gray” way of thinking will make you feel a lot better than “black or white”. Black or white thinking creates a false choice between only “black” or “white” when “gray” may be the more appropriate and helpful view. If we only think in black or white terms, then we are unlikely to even consider gray” as a possibility . Even if life doesn’t work out exactly the way we think it should, there are still options and we can find a way to accept and deal with what has happened. There are very few problems in life that have NO solutions, so you need to be careful not to believe your black or white thoughts. Take care, and be sure to look out for the shades of gray. ← A “grounding technique” to decrease worry during exam time.